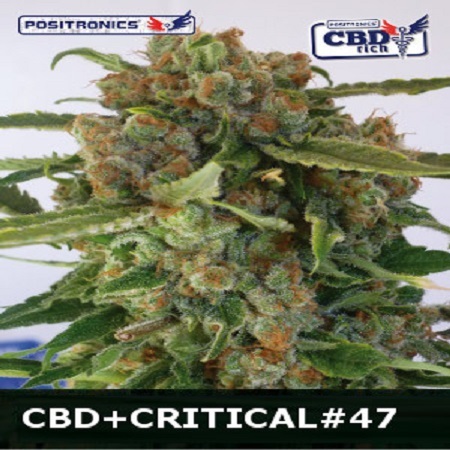 CBD Critical #47 Feminized Cannabis Seeds by Positronics Seeds: Maintains the productive capacity of our champion. 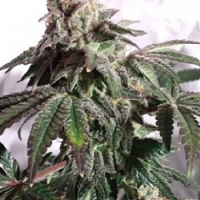 It grows like a sativa but with typical dense indica buds, recommended the use of tutors to support the weight of the lining of flowers, excellent for pain relief, sweet on the palate and very fragrant. Sensitivity to fungi: moderate with little sun exposure, high, perfect combination of these two families merged never before, thanks to previous work developed by CBD crew. 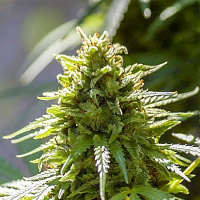 Maintains its initial vegetative structure similarities sativa, leaflets and thin stems, but already in bloom show his accelerated speed with dense and heavy flower clusters, high and low internodal branching away, so large specimens require pruning branches surplus. AROMA: skunky light background with mix of new and more subtle nuances unnoticed. Taste: citrus bouquet with notes of caramel acid but not as explosive as its critical effect ancestry 47: characterized by a high concentration of CBD. The CBD is not psychoactive but psychotropic, so its effect acts at physiological levels, with all the virtues that entails. INDOOR: Requires proper supplementation of nutrients for their maximum production and expression. Outdoor: specimens of medium size or large require tutors for stability, advised maximum sun exposure for optimal production of cbd.